The LCCAS Board met with the the adjuster for our insurance company, engineer, consultant and environmental contractor today. The insurance company will start with removing the asbestos and lead paint. Next they will shore up the arena for salvaging. The entire arena will be then be demolished, saving the existing ice surface and curling rink. A new metal building will then be built with the same square footage of the current building. More details will be provided in the Village Happenings. 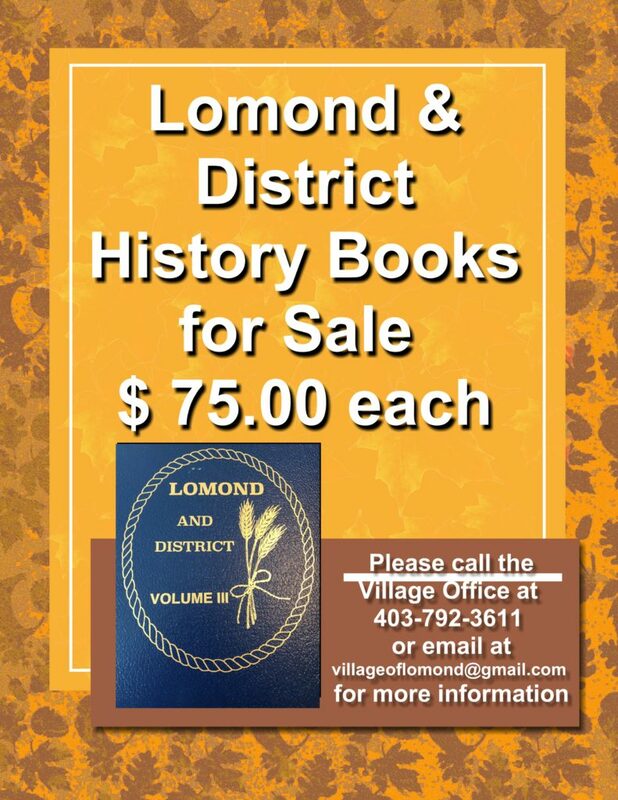 If you haven’t already purchased your Lomond History Book, now is your chance! All three candidates successfully returned to office by acclamation. Becoming an Elected Official is an excellent way to serve your community yet it requires a certain amount of time and effort. The information below outlines some of the expectations and requirements of Elected Officials in the Village of Lomond. Nomination Day is Monday, September 18, 2017 from 9am to noon. A candidate is required to bring their nomination papers with 5 signatures and a check or cash for $25. Celebration to take place July 15, 16, 17th 2016. Evening start of ball tournament and beach volleyball. 6-9pm – Lomond Community Club’s evening of food and fun starting with supper, followed by raffles and draws, races and games for kids, popcorn and bonfire. 9-11pm – Teen dance at Tennis Court organized by School Leadership Group. 11pm – Village of Lomond and Sponsors amazing display of fireworks. 1145am – Opening Ceremonies: Welcome by the mayor and dignitaries will take place in the arena. 12pm – History Book unveiling and first edition auction. 2-230pm – Library will provide refreshments and cake after your veiwnig of the Heritage Garden Displays of local school sites and the names of personnel serving in the armed forces. 3-430 – School and Multi-purpose facility tours. Ball Commitees beer garden and dance.